In Greek mythology, Psyche was a mortal woman whose beauty was so great that it rivalled that of the goddess Aphrodite. Aphrodite became so jealous of Psyche that she sent her son, Eros, to make Psyche fall in love with the ugliest man in the world. However, Eros accidentally pricked himself with the tip of his arrow and fell madly in love with Psyche himself. He took Psyche to his palace and showered her with gifts, yet she could never see his face. While visiting Psyche, her sisters roused suspicion in Psyche about her mysterious lover, and eventually, Psyche betrayed Eros’ wishes to remain unseen to her (see Figure 1). Because of this betrayal, Eros abandoned Psyche. When Psyche appealed to Aphrodite to reunite her with Eros, Aphrodite gave her a series of impossible tasks to complete. Psyche managed to complete all of these trials; ultimately, her perseverance paid off as she was reunited with Eros and was ultimately transformed into a goddess herself (Ashliman, 2001; Greek Myths & Greek Mythology, 2014). Figure 1. 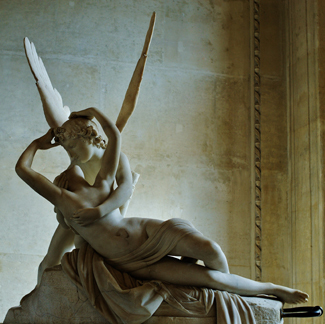 Antonio Canova’s sculpture depicts Eros and Psyche. Psyche comes to represent the human soul’s triumph over the misfortunes of life in the pursuit of true happiness (Bulfinch, 1855); in fact, the Greek word psyche means soul, and it is often represented as a butterfly. The word psychology was coined at a time when the concepts of soul and mind were not as clearly distinguished (Green, 2001). The root “ology” denotes scientific study of, and so psychology refers to the scientific study of the mind. Since science studies only observable phenomena and the mind is not directly observable, we expand this definition to the scientific study of mind and behaviour. It was not until the late 1800s that psychology became accepted as its own academic discipline. Before this time, the workings of the mind were considered under the auspices of philosophy. Given that any behaviour is, at its roots, biological, some areas of psychology take on aspects of a natural science like biology. No biological organism exists in isolation, and our behaviour is influenced by our interactions with others. Therefore, psychology is also a social science. In addition to these broad-based skills, psychology students come to understand the complex factors that shape one’s behaviour. They appreciate the interaction of our biology, our environment, and our experiences in determining who we are and how we will behave. They learn about basic principles that guide how we think and behave, and they come to recognize the tremendous diversity that exists across individuals and across cultural boundaries (American Psychological Association, 2011). Next, read this brief blog post that provides a quick overview of six strategies for effective learning (once again, based on empirical research in psychology). What is Psychology? by Rajiv Jhangiani, Ph.D. is licensed under a Creative Commons Attribution 4.0 International License, except where otherwise noted.